Summer in Sydney is all about the ocean and with good reason. 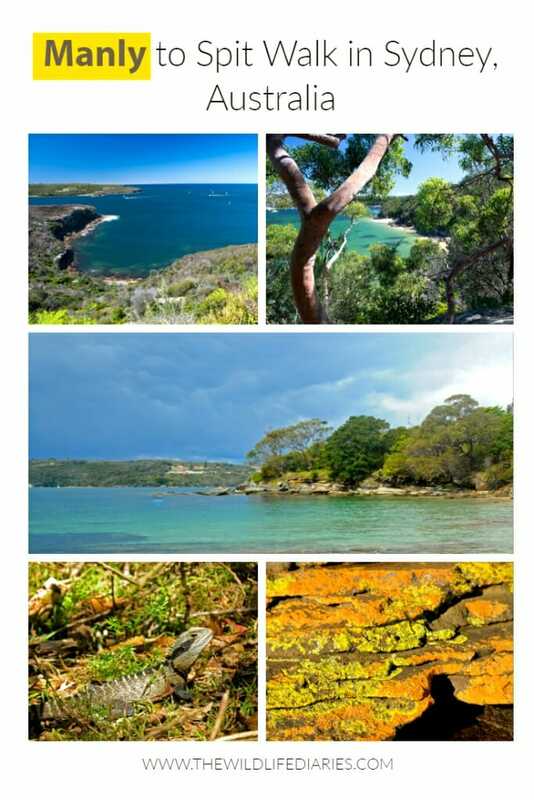 There are some spectacular seascapes around Sydney. 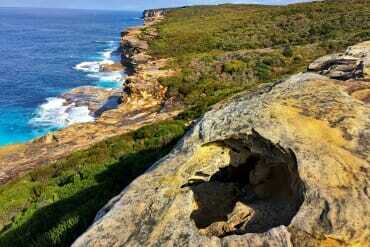 One good way to experience Sydney Harbour is by taking the Manly to Spit walk, also known as Manly Scenic Walk. 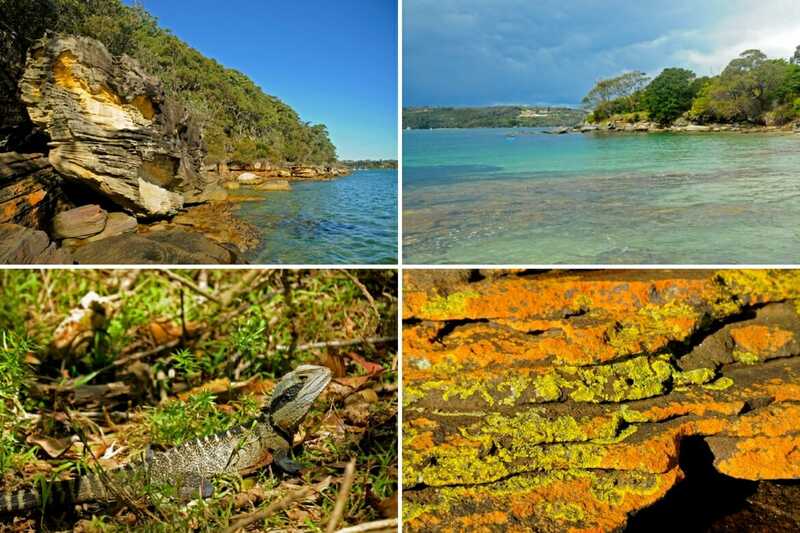 Not only it is a stunning coastal walk, but it is also a good opportunity to see some of Sydney’s wildlife. Getting there: Catch a ferry from Circular Quay if you are starting in Manly, or take 178 or 180 bus from the city to Spit Bridge. Beginning at Manly, the scenic walkway follows the waterline at Manly Cove, past Manly Aquarium and continues to Fairlight Beach. 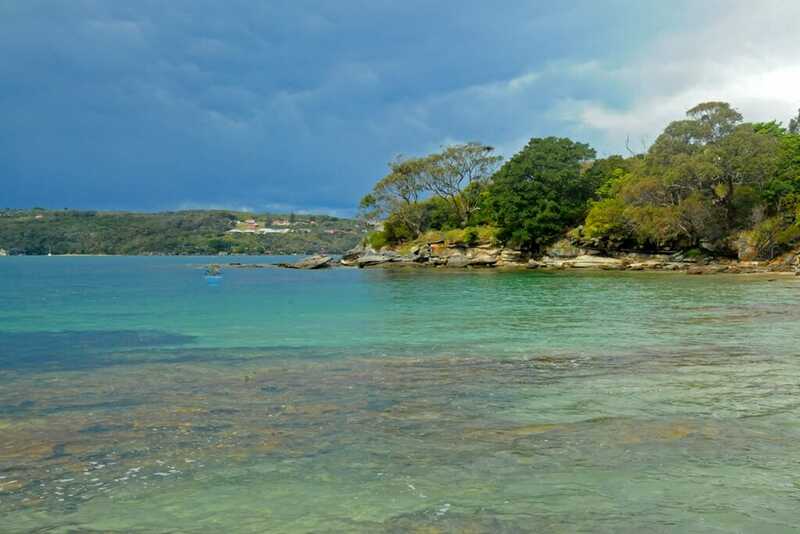 Fairlight Beach is an 80-meter long beach surrounded by waterfront houses. The beach is much calmer than Manly, perfect for scuba diving, kayaking and paddleboarding. 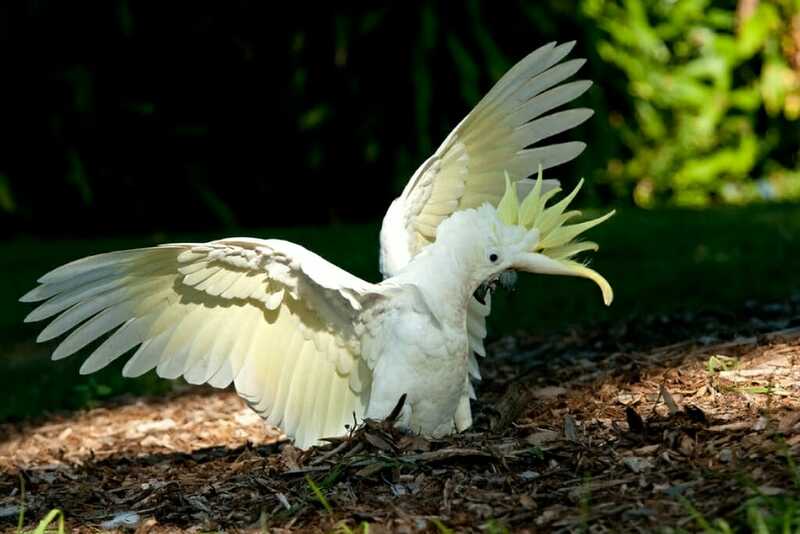 The trees growing along the beach are good for spotting flocks of Sulpher-crested cockatoos. After hugging the shoreline for a while, the trail climbs onto the street level and follows the road for about a block. From the street, the trail returns to the waterfront at North Harbour Reserve. 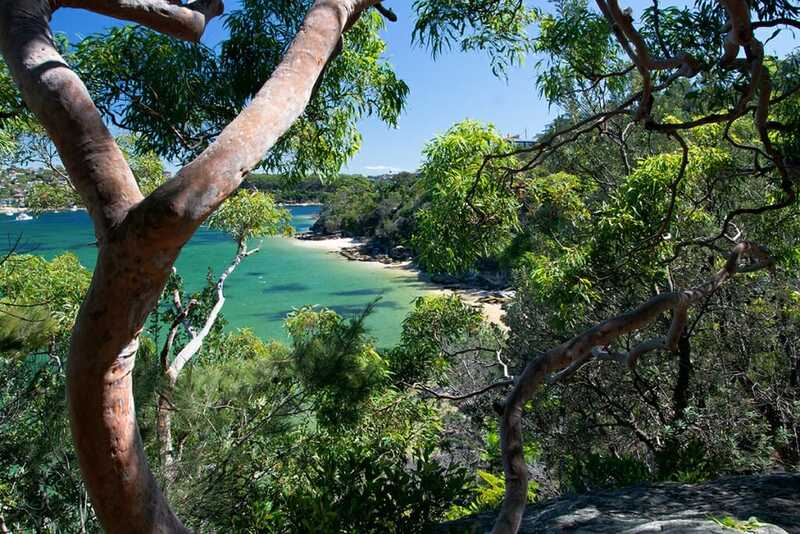 This is a quieter, more intimate beach with fantastic views of Manly Harbour and some attractive rocky coastline. Once the trail enters Wellings Reserve, the walk takes a much more wild feel. 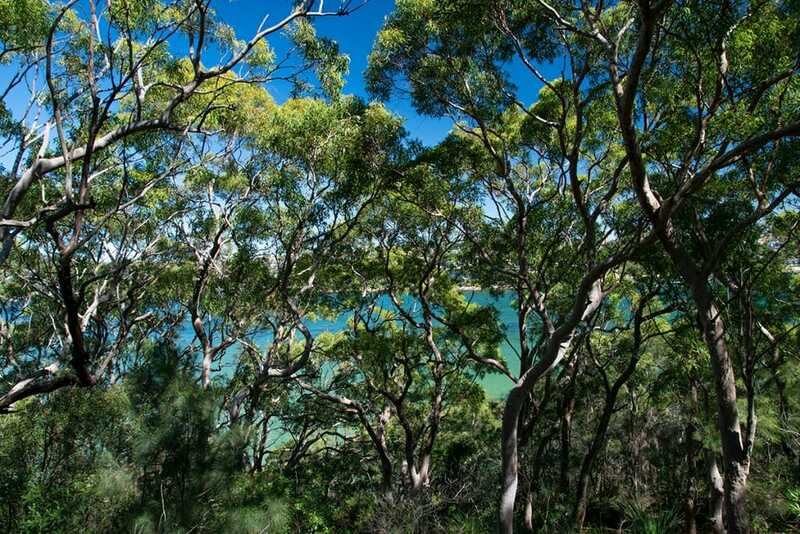 The ocean views peek through the gnarled shapes of mighty eucalypt trees, firns and bushes cover the side of the cliff and unseen birds chirp in the canopy. The walk follows the rocky water’s edge before arriving at Forty Baskets Beach. Forty Baskets Beach is a lovely quiet beach that faces onto Manly Cove. The origin of the name is uncertain, though it is believed to have been named after the fisherman caught 40 baskets of fish here to feed the troops detained at North Head Manly Quarantine Station in 1885. This dog-friendly beach and the surrounding grassy lawns are a popular spot for a picnic. There are all the necessary facilities around – the toilets, bbq, netted pool and a children’s playground. As you walk along, keep an eye out for Pied cormorants, crested terns, masked lapwings and white-faced herons. 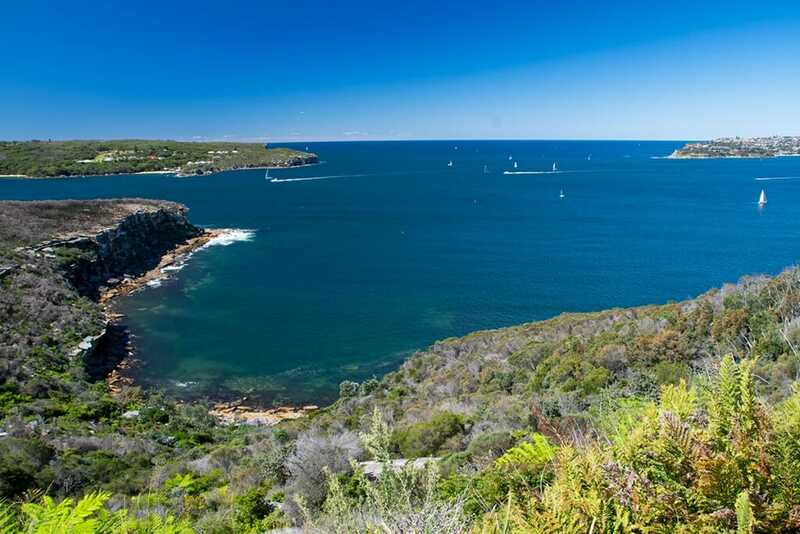 Following the rocky coastline from Forty Baskets Beach, the trail soon comes to a secluded Reef Beach with incredible views across Sydney’s North Harbour to Manly. This is a much more private beach with a distinctly wild feeling to it. You can meet a few kayakers here, but otherwise, you will probably have the beach to yourself. The beach has Aboriginal heritage and at low tide, you might even be able to spot some Aboriginal carvings and middens in the rocks. The tidal pools at Reef Beach are home to all sort of marine wildlife from tiny hermit crabs to starfish. 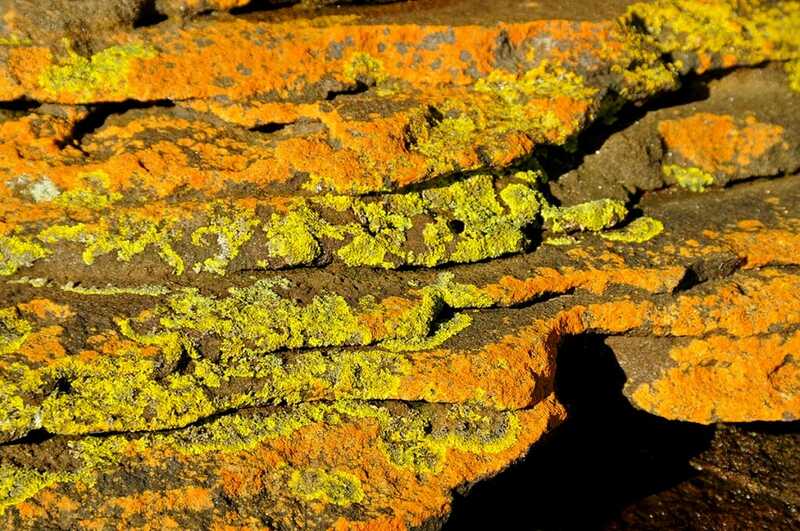 The water and the sandy strip of the beach are very clean and parts of the rock shelf are covered multi-coloured moss and lichen. After strolling along the waterline, it is time to do some work and climb onto the headland. The ascent is quite steep and it is this section that gives Manly to Spit walk its HARD grade. Good thing is, there are plenty of stunning lookouts to keep you distracted. Take a pause along the way and enjoy the views over the Heads and into the Tasman Sea. During the Humpback whale migration, you’ll have a good opportunity to spot some whales. The headland is also a good place to spot some birds soaring on the thermal currents above. Beneath the lookout is the Crater Cove, named for its dramatic shape reminiscent of a meteor impact crater. It’s not. This part of the coastline formed the same way as the surrounding cliffs. This is a popular spot for watching the famous Sydney to Hobart yacht race, which starts in Sydney every year on Boxing Day. 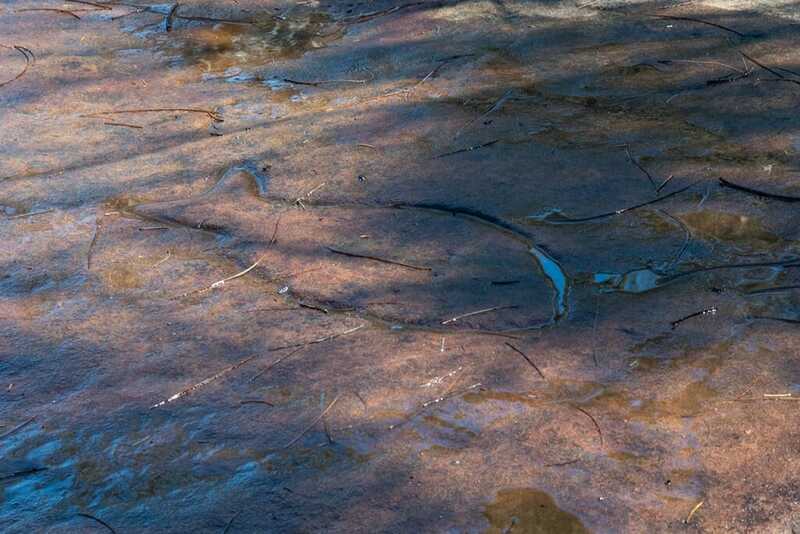 Just a few meters off the trail, there is an exposed area of rock shelf with about 10 Aboriginal engravings visible in the rock. Caved by the local Cammeraygal people, the engravings include a few carvings of a fish, a kangaroo, a whale, an emu, and what looks like footprints. The later could be natural indents in the rock platform, but they are sometimes refered to as ghost footprints. A set of rock steps cut into the cliff face that leads to a tiny trickling waterfall and the deserted Castle Rock Beach. The beach is peppered with giant boulders that are perfect for a rest stop. Dip your toes into the crystal-clear water, have a snack and watch out for the Little penguins. 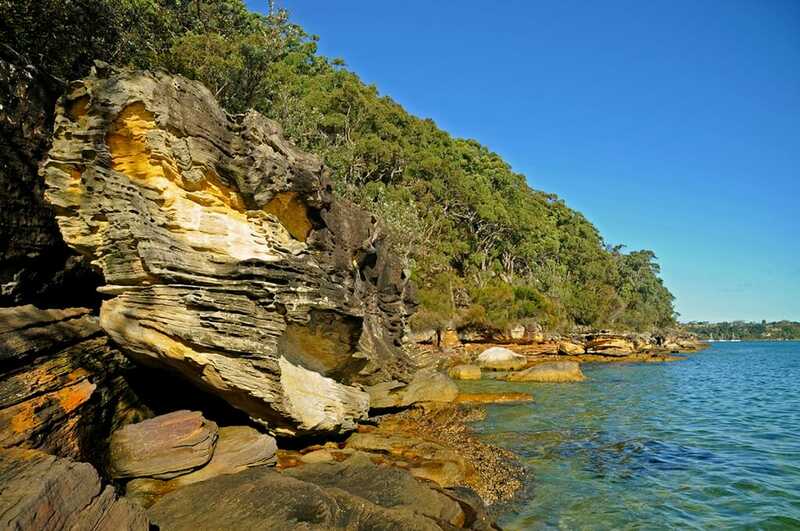 As you continue on the walk through the Sydney Harbour National Park keep an eye out for the Washaway Beach, aptly named due to it washing away during the high tide. Once you are done, you can climb over the boulder to the next beach, or climb back up the stone steps and walk across Duke of Edinburgh Reserve. From Castle Rock, the trail descends steeply into the little rainforest inlet of Duke of Edinburgh Reserve. The reserve owes its name to Australia’s only incident of an attempted Royal Assassination. In March 1868 a supposedly mentally disturbed Irishman Henry O’Farrell attempted to shoot Prince Alfred Duke of Edinburgh, son of Queen Victoria, during his visit to Clontarf. The bullet didn’t cause any major injuries to the prince, but the tiny reserve received a Royal name. From the reserve, the trail climbs down to Clontarf Reserve – a broad waterfront park popular with families and picnickers. During the summer months, it gets quite busy on the weekends. There are restaurants, cafes, BBQ facilities and a netted swimming area at Clontarf. Skirting the waterfront, the trail becomes a boardwalk along Sandy and Fisher Bays with patches of subtropical rainforest in between the luxury houses. The Spit Bridge is right in front of you now spanning across the Middle Harbour. Ellery’s Punt Reserve is the final point on Manly to Spit walk. From here, you climb the steps up to the bridge and finish the 10-kilometre walk with the sweeping views of the Middle Harbour from above. Apart from spectacular scenery, the walk usually turns up some local wildlife. Eastern Water dragons can often be seen sunning themselves on the rocks along the shore. The Dobroyd Head is good for bird watching and there is always a chance to spot a Little Penguin along the shore.